This is a new and easy to use flash that was placed in a compact body that looks very good and also practical. Don’t be fooled by the appearance because this flash is very sophisticated and Nikon has placed a lot of effort into it and made it a good addition to the existing lighting techniques and improve the Nikon Creative Lighting system. The SB 700 is a great accessory for your camera that will pull its weight in almost any occasion being ideal for all types of events from portrait to studio and night time shooting. It will be available for amateurs and professionals alike from late November at a price of almost 340 euros. This new Nikon Speedlight is very nice to look it and is also very easy to use. The operating system might take a bit to get used to but Nikon has made it very easy to understand while also incorporating the latest functions from the SB 900 flash. Things like i-TTL from Nikon and through the lens metering system can be found when using this flash and users will also be able to benefit from multi step auto zoom that will automatically detect the focal length used and change the flash output for angles of view that can vary from 24mm to 120mm. Things are made easier by this automatic system and amateurs can use its whole potential with just a flick of a button. The interface is easy to access and users can browse through the menu with great ease thanks to the well placed buttons on the back of the flash. The SB 700 can be controlled wireless proving to be very useful in different situations and can easily be mounted on top of FX and DX cameras. This flash is multifunctional and can act as a master or as a remote unit in a flash set up; this option can easily be changed from a switched or turned off altogether. When using it as a master, users can control two groups of flashes as well as their ratios, or they can just use it as a remote unit. This flash is great for conditions that present to be tricky with not enough light to get the desired results and it comes equipped with the useful Nikon Diffusion Dome that will be great in this situations; this feature can soften the shadows and even the light offering a much better result all-around. A close look on how it is presented will let any photographer know that Nikon hasn’t cut any corners when making it. It looks very professional and yet the menu and features can be easily accessed. As far as attaching it goes, it has mounting foot lock lever that will make it easy to attach and take off when needed. Nikon hasn’t forgotten those that like to shoot outdoors in rainy conditions and has given them the option to get a weather sealed mount. 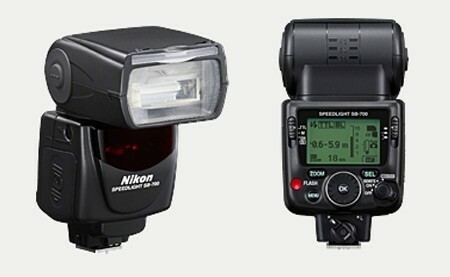 In conclusion, Nikon is ready to release a new flash that will make things much easier in almost any occasion. The Speedlight SB 700 is a very useful accessory for FX or DX camera and users will gladly take advantage of this opportunity to extend their Creative Lighting System.